We’ve had a bit of a cold snap (though nothing compared to those of you still with snow) so it doesn’t quite feel like it yet, but I’m happy it’s here all the same. 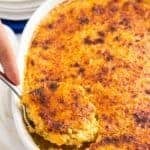 Today, I’m excited to share with you an old family favorite. This is my mom’s classic Southern deviled eggs. And I’ve been eating them ALL my life. 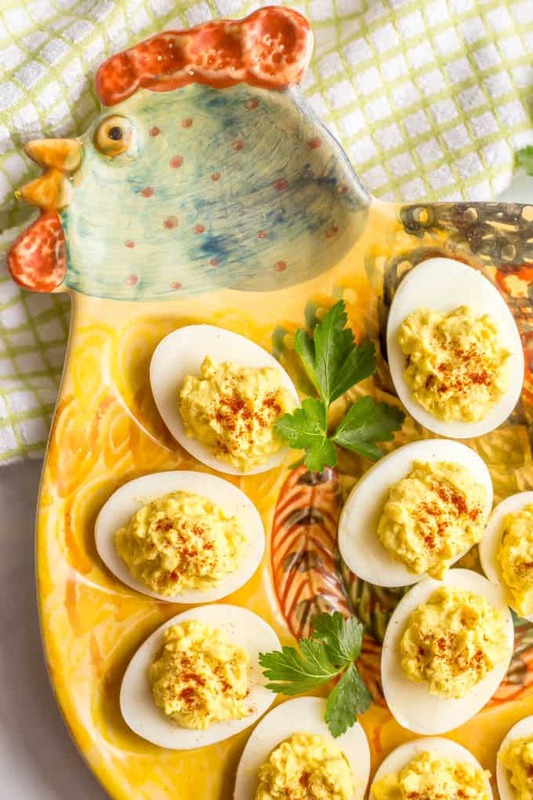 These traditional deviled eggs were part of nearly every Thanksgiving, Christmas and Easter spread we had growing up, as well as most picnics and BBQs. 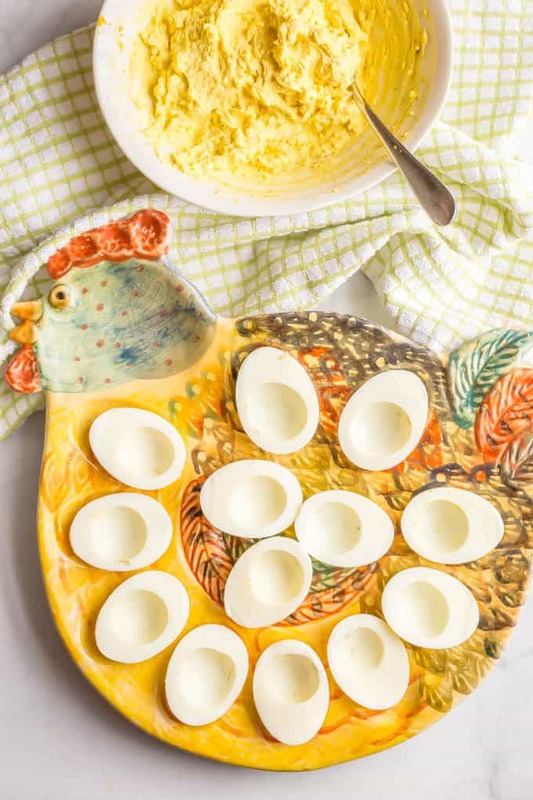 They are easy to make – I was always in there beside my mom, and often my grandmother too, helping to mix and stuff the eggs – and they turn out fabulous every single time. 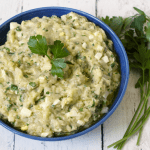 The pickle relish in this recipe makes these more of a Southern style, as does using Duke’s mayonnaise if you are a traditionalist. I think deviled eggs with relish have a great texture and a hint of sweetness that makes them extra irresistible. I will say, I had to measure carefully as I was creating this recipe for you. Cause we’ve made them so much, we do just know the consistency and taste when we get it there. But I wanted to be a bit more specific for you. 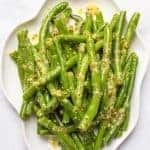 You can feel free to invoke that spirit though and add a little more of this, that or the other as you make these to get them just the way you like. Oh, and if you don’t particularly care for deviled eggs with pickle relish, you can leave it out. I’ve done that when I didn’t have any on hand and they were still delicious. Even a bit smoother, which some people may prefer. 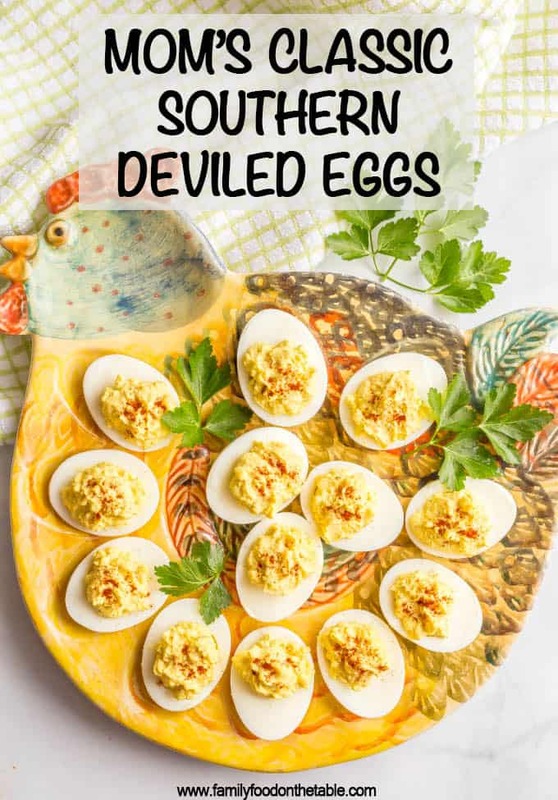 I also wanted to answer a few common questions about Mom’s classic Southern deviled eggs in case some of you aren’t as intimately familiar with them as we are. I made sure to consult my mom and I even checked with my Aunt on these, because I knew she would have opinions too. All good Southern women do. And we don’t always agree on the “right way” to do things. What’s the best way to peel hard-boiled eggs? We are mostly old school. My mom and I let them cool a bit, tap them all over to crack them, then peel them under running water. They say it helps not to use super fresh eggs. It has to do with the acidity level in the whites of the egg. Eggs bought at the grocery store are at least 30 days old, so they should be fine. My aunt’s method is to drain the water from the pot they cooked in, then swish them around in the pan to crack them. She adds ice water, let’s them sit for about 5 minutes and then peels them. There’s also a few other hacks you can try. Here’s an article with 5 egg hacks (including videos) if you want to check it out. What are the best occasions to serve deviled eggs? Anytime! 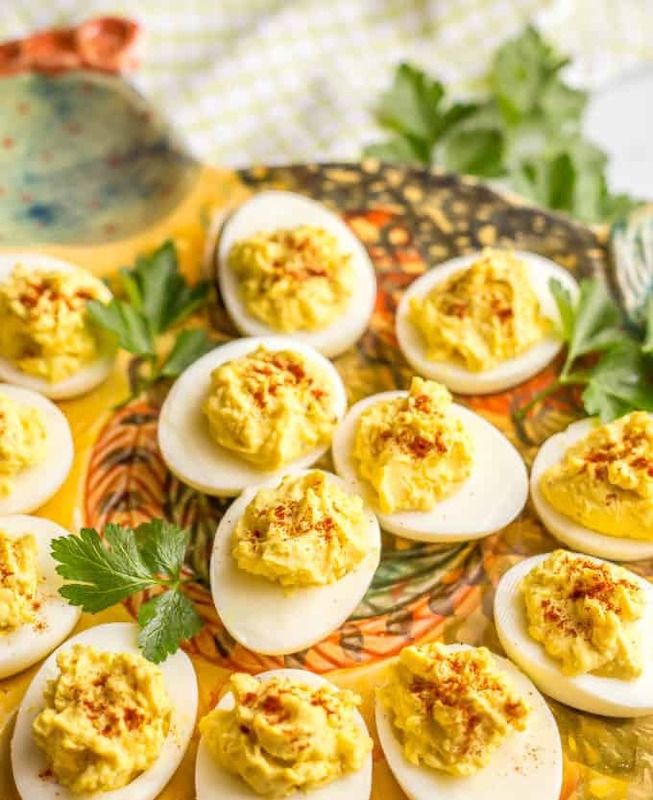 Deviled eggs are especially great for holidays (Easter, Thanksgiving and Christmas especially) as well as picnics and potlucks, BBQs and funerals. How many deviled eggs should I make? My mom recommends cooking at least 1 full egg per person and probably a few extra. What are the best toppings for deviled eggs? You know I love toppings! 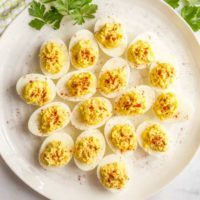 Some fun ideas for deviled egg toppings: Sprinkle of paprika, chopped parsley, snipped chives, capers, pimientos, caviar or cooked, crumbled bacon. You can make deviled eggs up to one day in advance. Deviled eggs will keep for up to two days in the refrigerator. Store them in a single layer in a covered container. 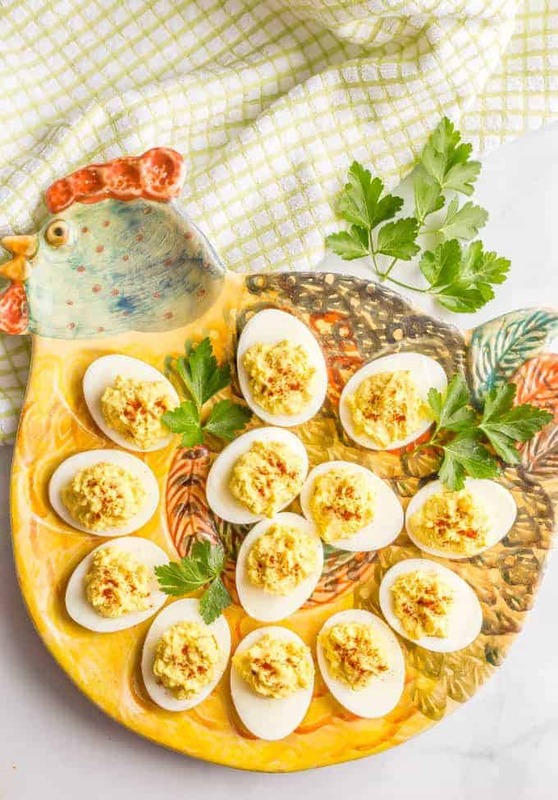 What can you do with leftover deviled eggs? Leftover deviled eggs can be used for appetizers, on salads or chopped down and used to make egg salad for sandwiches (like my egg salad BLT sandwich). 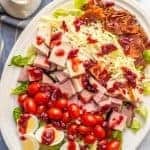 I also serve them on my Thanksgiving leftovers chef salad if we have extras after the big meal. 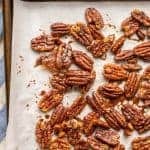 I hope you give these a try and make them part of your family traditions. My mom’s classic Southern deviled eggs are simple to make, deliciously creamy and perfect for holidays, family gatherings and special occasions! 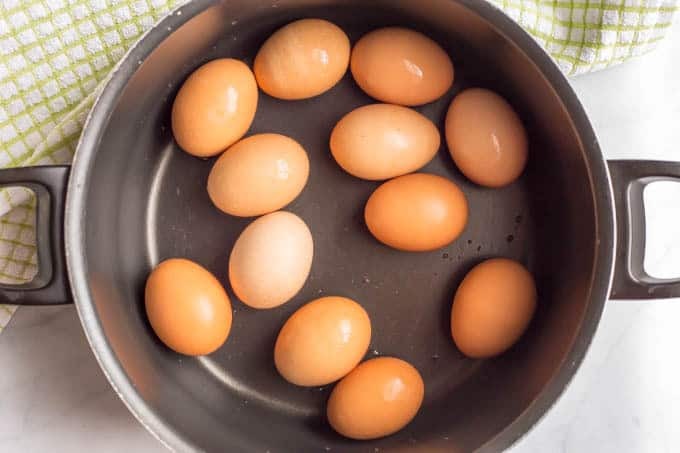 Place eggs in the bottom of a large pot and cover with cold water. Bring water to a boil over high heat. Turn off heat, cover the pan and let the eggs sit for 20 minutes. Drain the eggs and rinse them with cold water. Peel the eggs then cut in half lengthwise. Scoop out yellow yolks and place them in a small bowl. Plate egg white halves on serving plate. Use a fork to mash the egg yolks. Add the remaining ingredients and mix well. Season to taste with extra salt and pepper as needed. Fill each egg half with the yolk mixture, mounding it up a little. 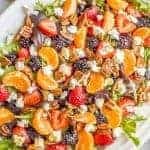 Sprinkle with desired toppings and serve. Fun topping ideas for deviled eggs: Sprinkle of paprika, chopped parsley, snipped chives, capers, pimientos, caviar or cooked, crumbled bacon or an olive slice. Officially spring but we have snow and minus degrees – a bit depressing! My grandmother in Romania used to make her deviled eggs exactly the same way, the same ingredients you use, world’s apart. 🙂 🙂 They are delicious, I make them myself too from time to time. There’s nothing like deviled eggs this time of year! I adore the platter, too! What a wonderful recipe! Mom’s recipes are always the best!